A Lusan Mandongus gown for a wedding at Wise Wedding Venue with a bright colour theme and rustic elements and photography by LM Photography. Well hello amazing wedding! Lisa and Jon married in a beautiful church and held their wedding breakfast and reception at Wise Wedding Venue. Picture sofa swings, a tree house and a massive amount of love and smiles. Lisa and Jon enlisted the help of Sama from Utterly Wow to help design and coordinate their day. This is a great idea if you have a blank canvas and a lot of ideas and need a bit of help to rein your ideas in to create something cohesive and beautiful. I love the table decor, really fun and creative. 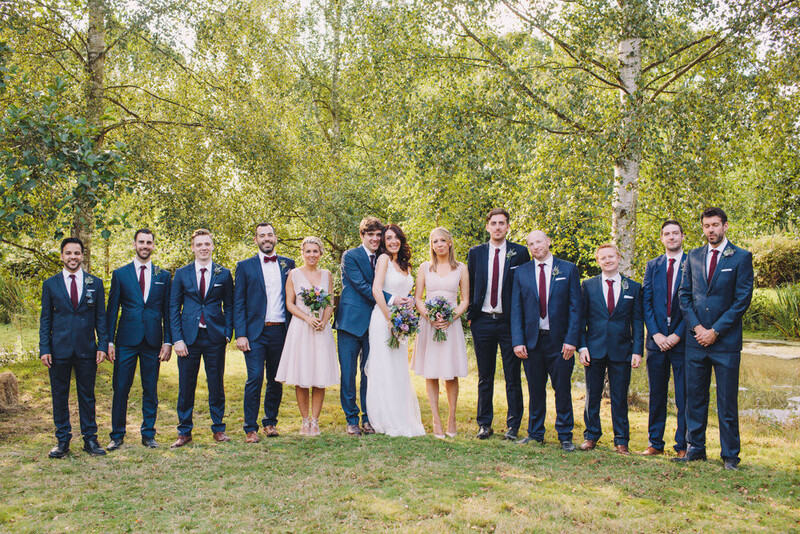 You’re going to smile a lot when you look at these photos, shot by the fabulous Laura McCluskey. Lisa The Bride: Jon and I met by chance on a holiday in Turkey in 2006. Jon had plans to go traveling not long after, so at first I was unsure how the relationship could possibly progress. But within a month I had booked a one-way ticket to join him in Australia. We spent the next 18 months backpacking round the world before heading back to the UK where I moved to London to be with Jon. 6 and a half years later, on Christmas Day 2012, he asked me to be his wife. We very quickly knew the kind of wedding we wanted. We didn’t want anything too formal, or structured, with a strong element of space and the outdoors being high on the list. 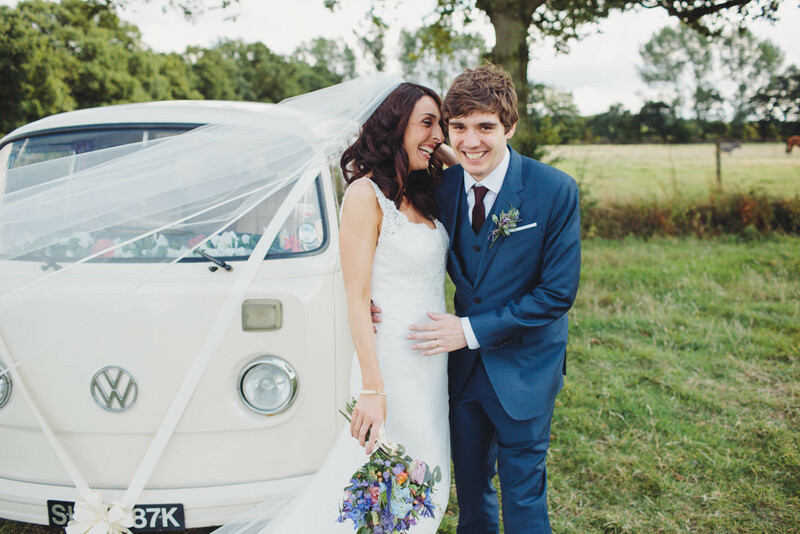 We looked at a lot of different venues, from cool pubs by the Thames, to Barns in the countryside, but when we visited Wise Wedding Venue in Kent we knew we had found the one. 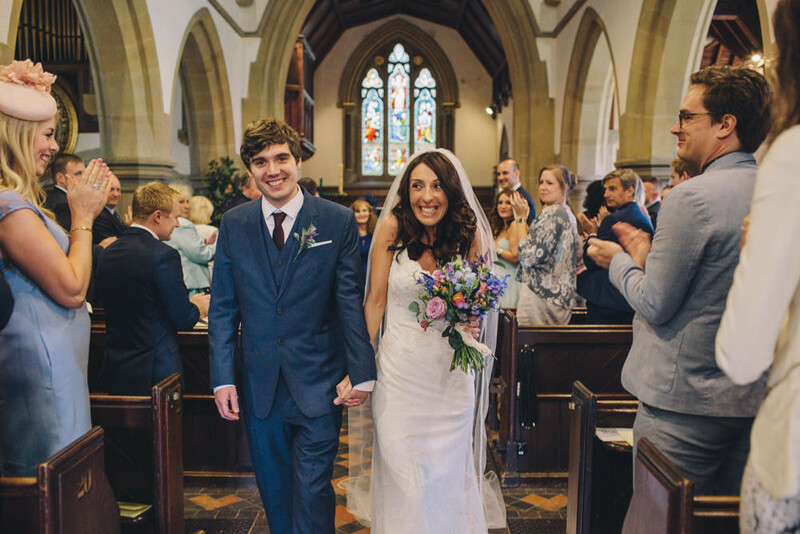 We got married at the beautiful St Thomas’ Church in Southborough. It was the same church Jon’s parents got married in so it held a lot of meaning for all of us. My favourite part of the day was the Church. Waking up the aisle with my dad by my side was one of the proudest moments in my life. I will never forget Jon’s face as I came into the Church, everything else faded away and all that mattered was getting to the top and being by his side. It was magical. 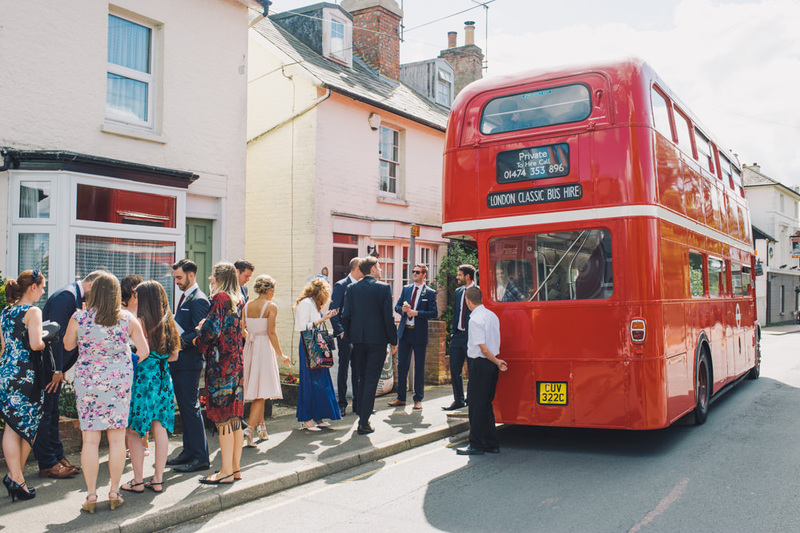 We wanted the transport on the day to be lots of fun so decided on a Routemaster bus for the guests and a VW camper van for us, which was a massive hit with all. Our wedding was booked for 23rd August 2014. 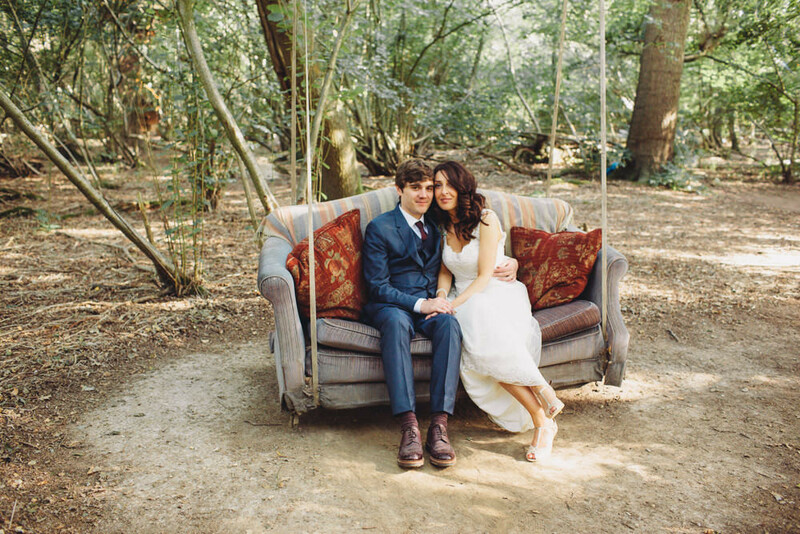 We were both so excited to be getting married at such a beautiful location, what with its winding paths through the woods lined with sofas hanging from the trees, a treehouse, stunning marquee and lake we could picture how much fun the guests would have spending the day there. My only worry was the weather, which is always a gamble with an outdoor venue. Jon however, was always very positive that it would be fine and whilst I did trust him, I not so secretly spent the next year and half worrying about it. Luckily, on the day, after a week of surprisingly cold and wet weather for August the sun came out for us all day. The venue was very much a blank canvas. 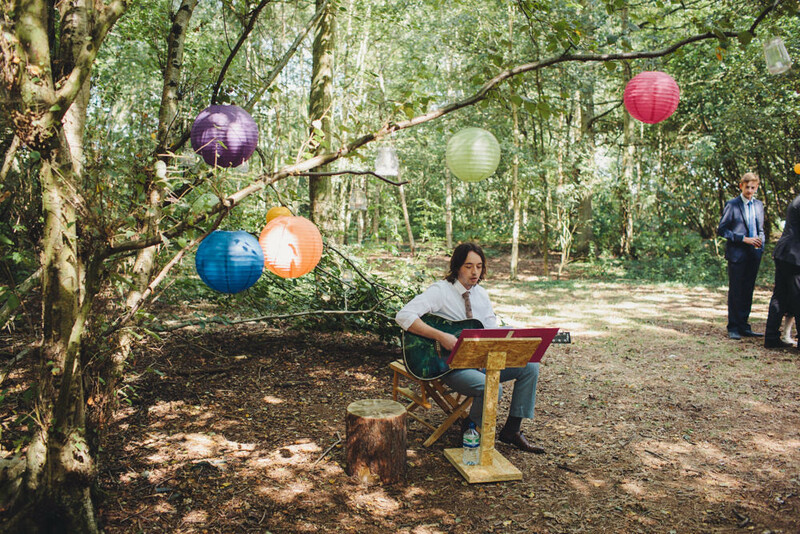 Jon wanted paper lanterns and lots of colour, whilst I wanted twinkly lights and rustic romance, but how were we going to pull this off? Enter the wonderful Sama from Utterly Wow. We met with Sama and straight away felt at ease, she knew exactly what we wanted and was a huge part of bringing our special day to life. Sama helped to create a colourful, fun, whimsical day that took a bit of bohemian inspiration from the gorgeous surroundings. 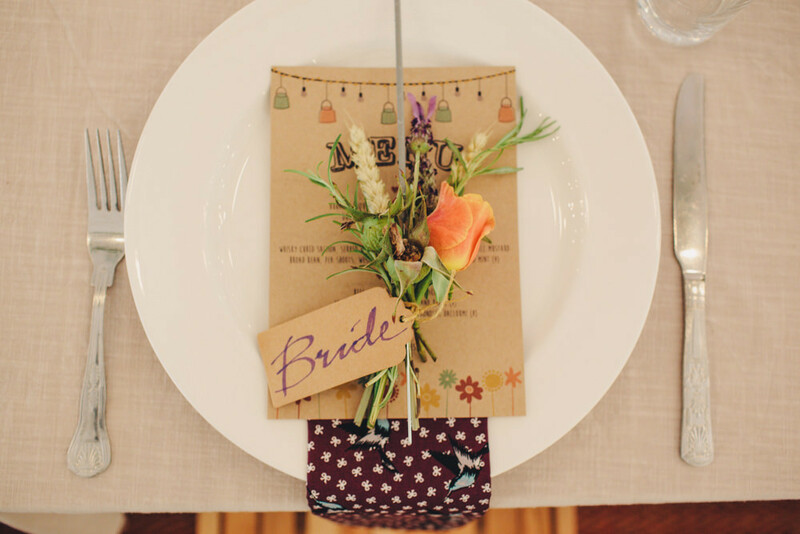 There were hand-made wooden signs, a floral archway, and streamers hanging from the trees, festoon lights, mis-matched napkins, rustic centrepieces and a hanging installation above the top table. Sama helped with setting up the venue and was there on the day of the wedding to make sure everything went smoothly. It was a real joint effort to pull the wedding off, our friends and family spent 6 months collecting jam jars which were painted and turned into beautiful table settings and lanterns (with the help of my maids and alcohol) and Jon’s mum tirelessly made over 100 napkins for us, along with the most delicious naked wedding cake. We couldn’t have done it without all their help and support. 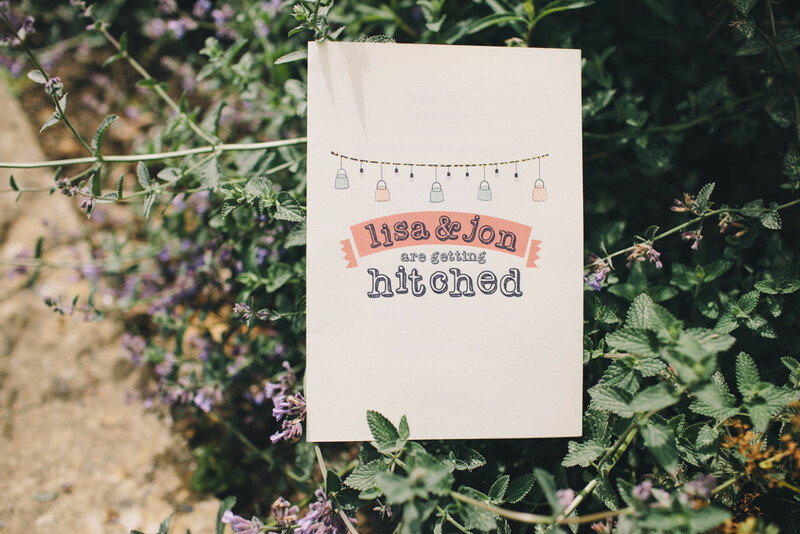 Jon is an Animator by trade so the task of designing the invitations was left safely in his hands. We wanted them to reflect the day, nothing too formal and full of colour, with brown parcel string and dried lavender to finish it off. We were so lucky to work with some fantastic people, one of which was our florist Cappy from White and Winsome. We said that we wanted the flowers to be wild and very colourful and boy did she deliver, from the table settings, to the archway, bouquets, button holes, the most beautiful place names and gifts for our mums. The dress was an LM collection by Lusan Mandongus, from Isabella Grace in Tunbridge Wells. I always knew I wanted something fitted and made from lace. I fell in love with the dress as soon as I tried it on and thought it was perfect for the outdoor setting. The shoes were Rachel Simpson and a gift from my Maid of Honour Caroline. They were so comfortable I could have danced all night in them (and I did). Jon decided on a very special 3 piece suit navy from Paul Smith in Covent Garden and with shoes from Grenson, which finished off the look perfectly. Jon and I were extremely lucky with our bridesmaids and groomsmen. They very generously bought their own suits and dresses which helped out a lot. Jon had eight groomsmen in total, which included two best men. The groomsmen’s suits were blue with a maroon tie. My two bridesmaid’s dresses were from Maids to Measure. I also had a bridesman whose suit was blue, but to separate him from the groomsmen he wore a bow tie. Finding the right person to do hair and makeup was very difficult for me, I wanted a natural wave and subtle but striking make up that would last all day. Andrea Lewis was fantastic and such a calming influence; she even helped my Mum with a potential last minute hair disaster. We are all foodies in the family so the wedding breakfast was important for us to get right. We met with Helen at Handmade Foods in Blackheath, and she proposed a really exciting feasting menu. We ended up serving four courses with eight separate dishes including Duck ham, barbecued Beef Skirt, whiskey cured salmon and Chocolate cheesecake. The food was fantastic, and the feasting element where people shared food around was a lot of fun. As the sun set the bonfire was lit and so were the sparklers, which was a perfect introduction for the start of the evening. For music we chose a DJ from Discowed. They played fantastic music all night and kept the dancefloor packed from start to finish. We also had a family friend playing some of our favourite songs on acoustic guitar as the guests arrived at the venue. At this point we served Pimms and Canapes and guest were able to take in the natural beauty of the venue, and explore. The lovely Laura McCluskey was our photographer and we couldn’t be happier with the wonderful photos she has taken. Laura’s pictures were so beautiful; she really captured the spirit of the day and everyone’s personalities perfectly. As for advice, just enjoy it and remember what it’s all about; marrying the man you love and chosen to be with for the rest of your life. The rest is just a bonus. Lovely. Any idea where the beaded garter is from? It’s gorgeous! 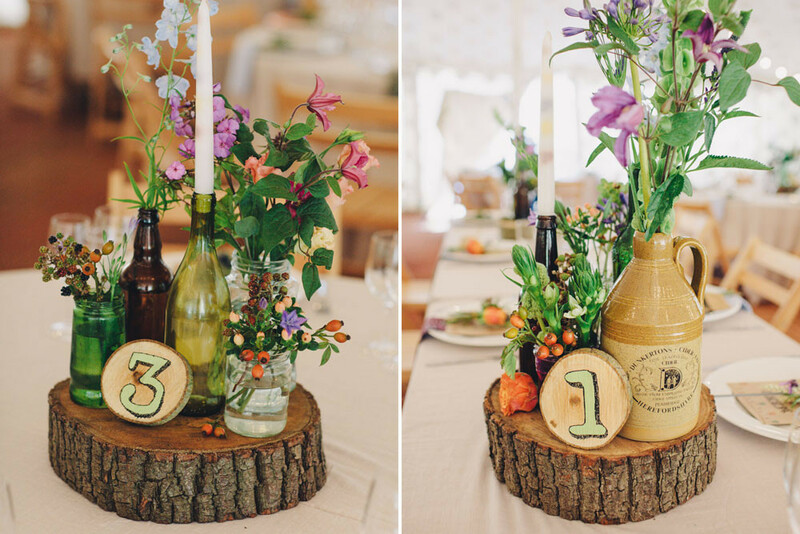 beautiful wedding with some amazing touches, love the boozin’ sign!